After seeing a good deal posted on slickdeals.net last week about these SDHC cards from Team Group. I decided to bite. Newegg was offering these cards at around 8 bucks each, so I decided to purchase two of them. I figured for 8 bucks, I could use one of them for my Raspberry Pi, and the other I could stick in my camera bag as a backup. 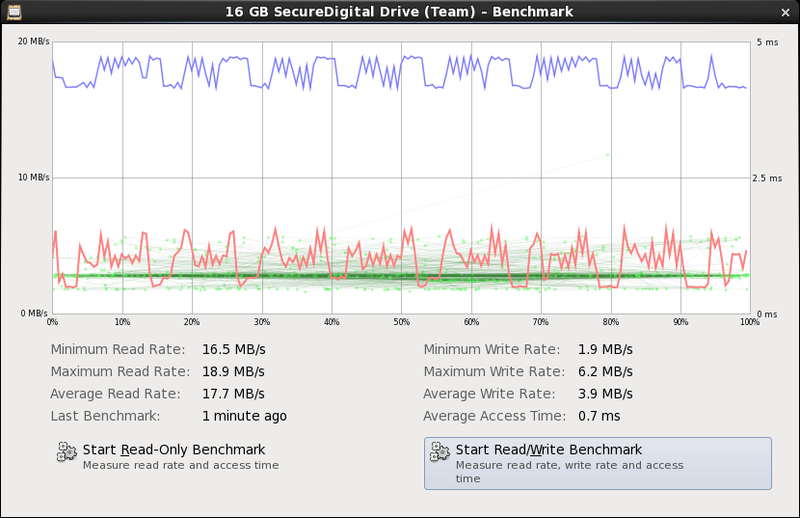 Afterwards, I decided to put an ext4 filesystem on the card and do another speed test using dd. And here is the same test with a smaller byte size argument: [[email protected] /]$ sudo dd if=/dev/zero of=/mnt/output.img bs=2k count=1024k 593791+0 records in 593791+0 records out 1216083968 bytes (1.2 GB) copied, 138.607 s, 8.8 MB/s For the money, these are good little cards. I would recommend them to anyone!